Beer lovers commonly enjoy their favorite imperial stouts and barleywines after aging them, sometimes for a few years. But a group of Finnish scientists have them beat by about 165 years. 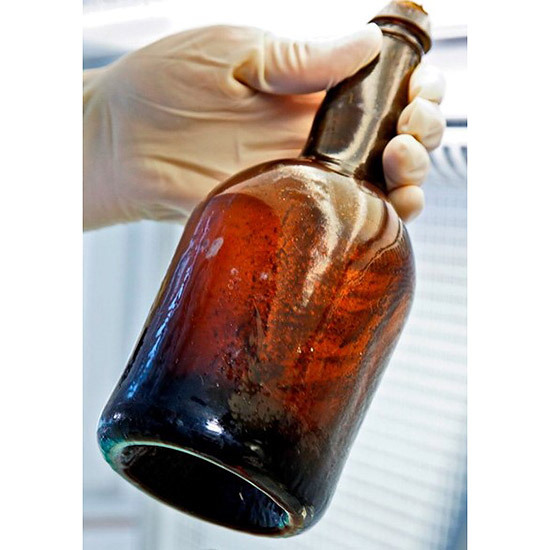 Chemists at VTT Technical Research Centre performed a chemical analysis of two beers rescued from a 170-year-old shipwreck in 2010. Like any good study on beer, this one began with a sniff and cautious taste test. Initially, the scientists described the beer as smelling of “burnt rubber, overripe cheese and goat” (try putting that on a label). Then they began the hard work of separating out individual chemical compounds by running them through an electric field. What did they find? Well, for starters, a lot of salt water. But after accounting for seawater, they found that one of the beer—which they are calling A56—was fruitier and more floral, while the other—called C49—was bitter and hoppy. The chemists also hypothesized that due to the brewing methods available at the time, both beers had a sour character as well. Regardless of how this Nordic brew may have tasted when it was fresh, we’ll pass on the aged version and sip a Baltic porter instead.